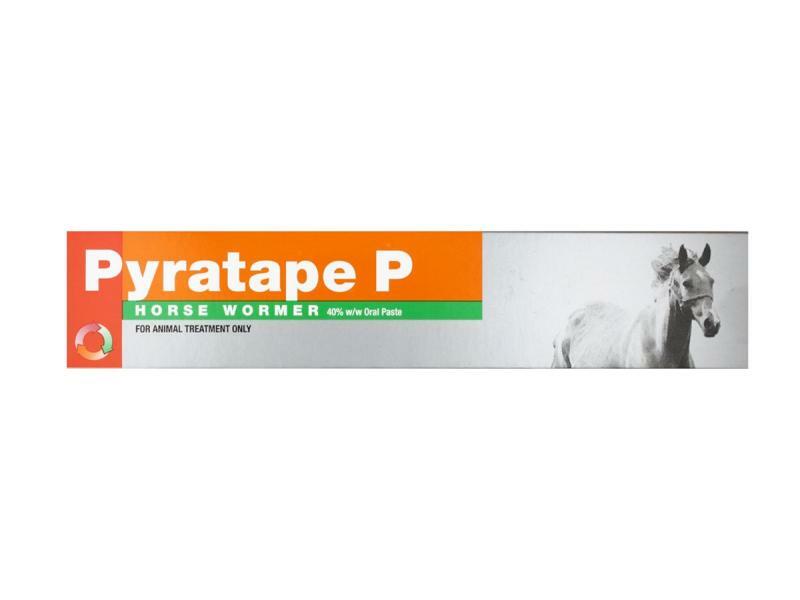 Pyratape P Horse Wormer is a broad spectrum, highly effective wormer using the active ingredient Pyrantel Embonate. Destroying and controlling adult infections of large and small Redworms, Ascarids, Pinworms and Tapeworms found within equine gastro-intestinal tracts. Suitable on horses, ponies and foals (POM-VPS). Please note that a double dose is required for the treatment of Anoplocephala (tapeworm). For example, a 500kg horse would need to be given enough product to dose 1000kg bodyweight, and you would need to purchase two syringes. Always fully read the data sheet before treating your horse or pony and feel free to contact us if you have any questions. The presence of worms can be checked in your horse using a Worm Testing Kit. A ready to administer, light yellow coloured, oral anthelmintic paste for horses and other equines. Each 28.5g syringe contains 11.4g pyrantel embonate as active ingredient. A broad spectrum anthelmintic for the treatment of adult infections of large and small redworms, Ascarids and Pinworms found in the gastro-intestinal tract of horses, ponies and foals. Pyratape P also treats and controls tapeworm infection. Administer orally, one syringe per 600 kg body weight as a single dose (=19 mg pyrantel embonate per kg body weight). Pyratape P should be used at a dose rate of 38 mg pyrantel embonate per kg bodyweight (i.e. twice the dose used for strongyles). The need for re-treatment may vary, but if considered necessary, should be carried out after an interval of 6 weeks. Not for use in foals less than 4 weeks of age. Do not use in animals with known sensitivity to pyrantel and in severely debilitated animals. The same syringe should only be used to dose two animals if they are both healthy and are either running together, or are on the same premises and in direct contact with each other. Pyrantel embonate is safe for horses and ponies of all ages, including sucklings, pregnant mares and studs. Impaction of the small intestine may occur in foals, infected with high numbers of Parascaris equorum. Symptoms (colic) may be seen as soon as 30 minutes after treatment. Combined administration of pyrantel and levamisole or piperazine is not recommended. It is safe to give the product to pregnant and lactating mares provided the recommendations are followed. Operator warnings: Direct contact with the skin should be avoided. Wash hands and any other parts of the body which comes into contact with the product after use. Avoid handling the product if you know you are hypersensitive to pyrantel. Not to be used in horses and ponies intended for human consumption. Do not store above 25 °C. Protect from direct sunlight. Keep syringe in outer carton. White, low density polyethylene syringe with a low density polyethylene cap. The syringe is fitted with a screw ring on a graduated plunger allowing adjustment of 1 to 6 doses of the product. Graduations on syringe at 100 kg bodyweight intervals. Below are some recent questions we've received regarding Pyratape P Horse Wormer, including answers from our team. Is this safe for a lactating mare with a foal? Is this wormer ok to use on mare with month old foal at foot.